Take I-77 to Wheatley Rd. exit. Proceed east on Wheatley Rd. for 3 miles until you arrive at Riverview Rd. Head south on Riverview Rd. to Bolanz Rd., then head east on Bolanz. You’ll find the Hunt House Trailhead and parking on the right. Entrance to the park is free; fees for special programs and additional accesses may be required. Tickets are required for the Scenic Railroad. Outside of the largely smooth ride, hike, or trail run from one end to the other, this section of trail has all manner of added value. 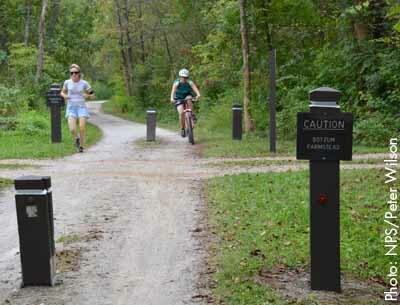 A bike connector trail leads to Hale Farm & Village (which requires a fee). This living history museum captures the soul of America during the 19th century and includes a working farm, a museum, and a recreated village populated by volunteers and employees in period costume. And then there’s Indigo Lake, which (as local lore tells it) arrived as a result of a bulldozer incident during a Gray’s Quarry sand-and-gravel excavation. Open to fishing but closed to swimming, the lake is just over 40 feet at its deepest and serves as home to all manner of waterfowl and woodland creatures. In the fall, Indigo Lake is like a postcard that has sprung to life. Just beyond this offshoot, trekkers are treated to a delightful Beaver Marsh, where these water rodents have dammed waterways with tree limbs and can often be spotted mid-evening gearing up for more work on their wetlands projects. A last push through the Ira Trailhead, with its beautiful hardwoods and canal locks, leads to Botzum Trailhead. Trekkers of all skill levels are likely to be drawn into this rustic, pastoral jaunt with eye-popping views. Birders, wildlife photographers, and wildlife enthusiasts are likely to be in lockstep with the hikers, bikers, trail runners, and the like, if they’re not one and the same. While amazing year-around, this section of trail is especially gorgeous during the autumn months. It is simply inspiring, and the appeal of the stops along the way make this especially good for multi-generational groups.